To improve the muscle function of the subclavius and pectorals in a horse it is always a good idea to teach your owners the sternal lift exercise. This exercise will improve the bow and string concept that Dennis speaks of. 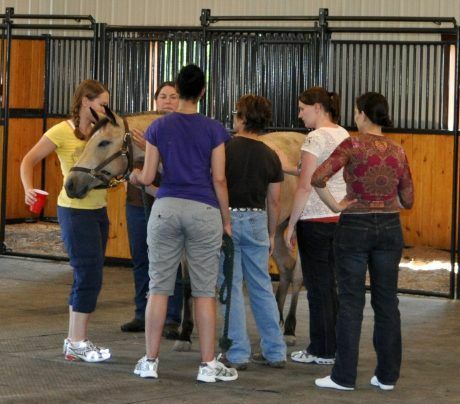 Slowly starting at the sternum and sliding the round edge of a hoof pick or your fingers down the midline, you will notice a rise of the lower cervical spine and withers. The point that this rise occurs is the point at which you hold for 3 to 5 seconds. Repeat for 3 to 5 reps. The horse is now doing an abdominal crunch. If there is not a lot of movement there may be a subluxation present and or just weak muscles. Remember by adjusting this horse you are stimulating alpha motor neurons and thus improving the strength of the horse. Over time there will be an increase in reponse as strength advances.